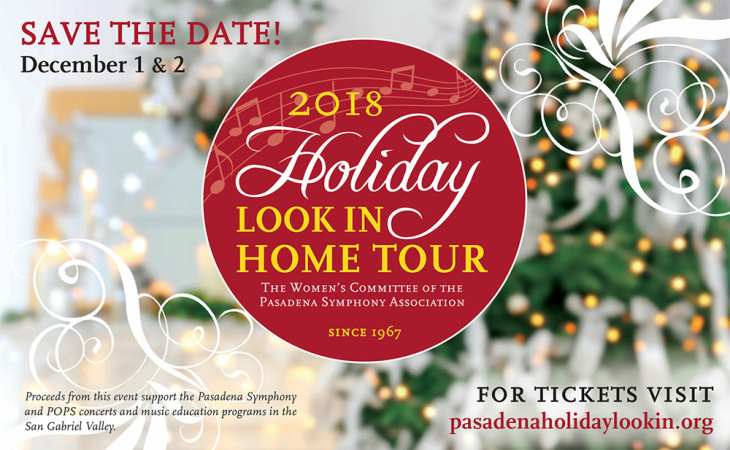 The Women’s Committee of the Pasadena Symphony Association will present the 51st Annual Holiday Look In Home Tour and free Boutique on December 1 and 2, 2018. The self-guided Home Tour will include four historic and architecturally significant homes and gardens in Pasadena and will be open from 9:30 a.m. to 4:00 p.m. The Boutique will be open from 9:00 a.m. to 5:00 p.m. at the Scottish Rite Cathedral, 150 N. Madison Avenue, Pasadena. This highly anticipated Pasadena tradition offers an opportunity to view the artistry of four of the City’s most prominent floral designers; this year including Seasonal Décor by Margit Holakoui, Contemporary Creations by Jacob Maarse, Yuletide Creations by Ixora Floral Studio and Festive Floral Designs by Drew Domenghini with Patterson’s Topiaries, Pots and Teas. As you tour the homes and gardens, you will enjoy the elegant music of talented Pasadena-area musicians. The Holiday Boutique showcases seasonal and year-round home décor items, delicious gourmet foods, unique jewelry, and other personal and gift items. No ticket is required for the Boutique and ample parking is available in the lots on either side of the Scottish Rite Cathedral. Since 1957, the volunteers of the Women’s Committee of the Pasadena Symphony Association have worked tirelessly to present the Holiday Look In Home Tour and Boutique in support and celebration of the world-class Pasadena Symphony and POPS. And, through the years, this event has evolved into one of Pasadena’s most cherished and highly anticipated holiday traditions. Tickets for the Home Tour can be purchased online or at French Hand Laundry, 606 S. Lake Ave., Pasadena, for $35 each. They can also be purchased during the event at the Scottish Rite Cathedral, 150 N. Madison Ave., Pasadena, for $40 each. If you have questions, please call 626-793-7272. All proceeds benefit the Pasadena Symphony and POPS and music education programs throughout the San Gabriel Valley. Founded in 1957, the Women’s Committee of the Pasadena Symphony Association is a dedicated group of volunteers who celebrate and support the musicians of the Pasadena Symphony Association through the annual Holiday Look In. During the past 50 years the Women’s Committee has donated over $3 million to the Pasadena Symphony Association. The Women’s Committee was pleased to donate $150,000 in proceeds from its 2017 Holiday Look In Home Tour. Proceeds from this event support the Pasadena Symphony and POPS annual concert series, as well as the educational outreach and community engagement programs such as the Pasadena Youth Symphony Orchestra, Pasadena Young Musicians Orchestra, and Pasadena All-City Orchestra. These programs continually offer robust musical training and personal development for young musicians throughout the San Gabriel Valley, fostering music appreciation and aptitude in future generations.